I love green walls, especially when they grow in the least expected place. Hence this one, that I found in the 2nd arrondissement, one of the most urban arrondissements in Paris. 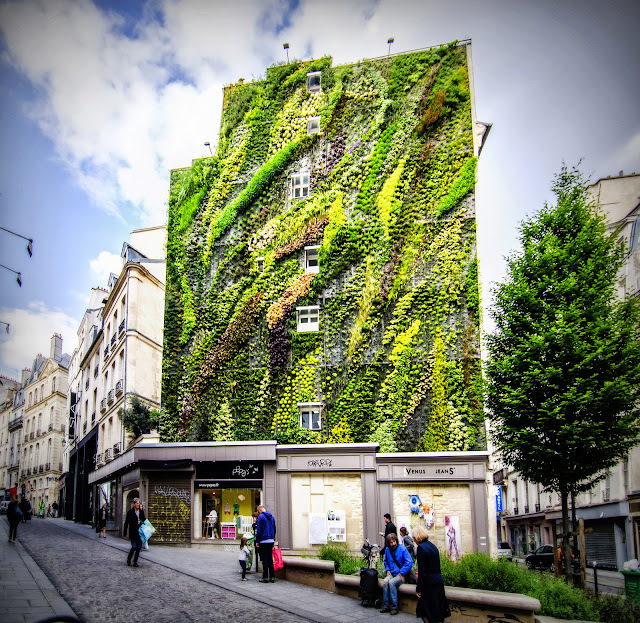 It's composed of 7600 plants and was made by Patrick Blanc, a botanist that invented - or at least developed - vertical gardens (green walls). Check his cool website! That is lovely! I imagine it takes quite a bit of maintenance to keep it looking fresh. I think part of the "creation" is to organize the watering system. Great timing, he will be in Sydney Sept 4-6! Thanks for the post Eric! Really?! Wow... This guy seems to be a rock star! I did not know. I just wanted to say that this truly has to be one of the most incredible web sites on the internet. I have followed your site for years and I just wanted to say "Bravo!!!" to you for continuing to take such beautiful and masterful pictures of Paris each and every day. I'm sure it isn't easy to continually maintain, however, I am one of those die-hard fans of yours who loves what you do and admire the quality of work that you put into it. I live in San Francisco and have never been to Paris, yet you take me there each and every day. Your work has always been the most perfect way for me to relax every day. Sitting down to a cup of green tea at the end of the day with anticipatory excitement waiting to see what the new picture of the day is and reading your thoughts about it. I should also say that your writing is always superb and always is just right. For me, the more, the better. I've always wanted to send over my thoughts and commendation to you. Please keep up the masterful work that you do; it has been an integral part of my day for years now. I will certainly remain one of your most loyal fans. Ryan, you made my day! Exactly what I needed. Actually what you wrote is so nice that when I started reading it, I almost erased it thinking it was spam! Merci beaucoup. ANd I hope you can make it to Paris for real one day! What an cool building! I can't get over how you are able to show us pictures from so many different areas of Paris - I continue to be so impressed. Well merci too ;-) Actually there are many things to photograph in Paris, only I don't always have the time to go everywhere I should! Beautiful! I want to walk down those narrow streets and see what's around the corner. It's a nice area. Very old, yet renovated. That is such a wonderful wall, all green and beautiful! What a great thing! There are a LOT of shop building in my town, imagine if they use this green vertical wall......... many citizen will happy..
but where is it exactly ? 83 Rue Aboukir, 75002 Paris, France! That is totally awesome and amazing. I love it!